“Choose a passerby, someone you don’t know,” the voice told me. I spotted a tall athletic man in grey sweatpants and a white T-shirt. The voice told me to follow him, and so I did. I felt like a spy, walking along the Santa Monica Pier in broad daylight, inconspicuously following a stranger. The voice told me to mirror the man’s posture, rhythm, and movements. It’s surprisingly easy to follow a stranger, observe them closely, and even imitate their gait without them or anyone else noticing. But I’m no spy, and I’m not a stalker. So I didn’t follow the man for long. Soon enough the voice told me to slow down, come to a stop and whisper a soft farewell to my stranger as he walked away. As I wished him well and watched him fade into the crowd, I was struck by the fact that, under ordinary circumstances, I would never have even noticed this man. I paid attention to him on this particular day because I was participating in Among Us, a uniquely interactive and immersive “auditory performance in public space” created by Dutch director Marike Splint. 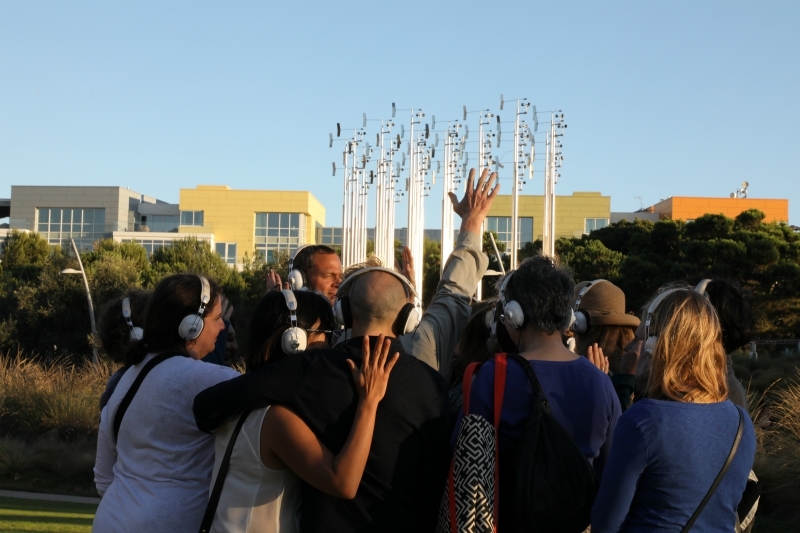 Among Us is part audio-guided walking tour, part performance art, and part theater. 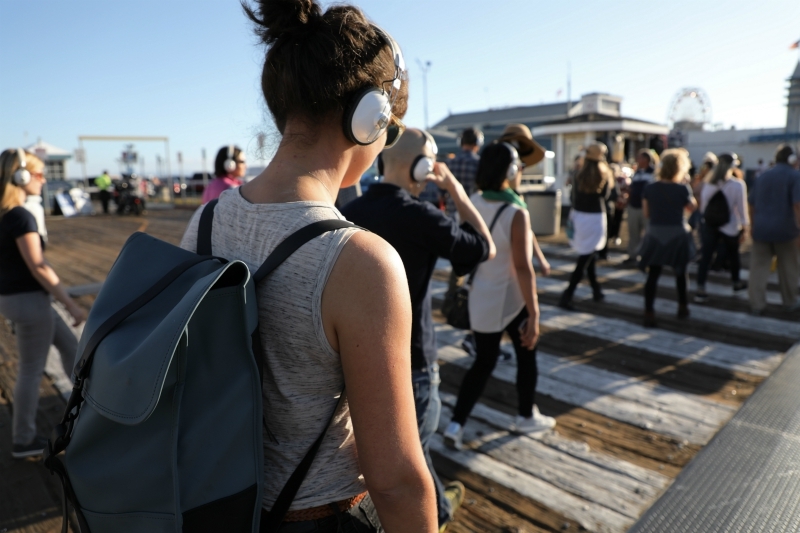 It invites participants to don headphones and walk through a crowded public space, to observe that place and the people who inhabit it from a new perspective and to thoughtfully consider the nature of community. Splint, an assistant professor at UCLA’s School of Theater, Film, and Television, has long been interested in exploring ideas surrounding community. Her work regularly moves audience-participants outside traditional theater spaces. Splint developed Among Us several years ago in the Netherlands, where she produced it first in a bustling urban train station in Amsterdam and later in a pastoral field on an island as part of the Oerol Festival. After moving to L.A., the director reformatted the piece for the 2016 Los Angeles Exchange [LAX] Festival, setting it in Union Station and altering the text to work for an American audience. That’s where Naomi Okuyama, the city of Santa Monica’s cultural affairs supervisor, attended a performance. She invited Splint to bring the show to Santa Monica, where it has since been performed multiple times and where it is being produced this weekend as part of the city’s Art @ Tongva 2018 season (tickets for the May 12 and 13 performances are $15). In Santa Monica, Among Us takes place across two distinct “acts,” the first of which is a fascinating exercise in active observation. The journey begins on the pier. 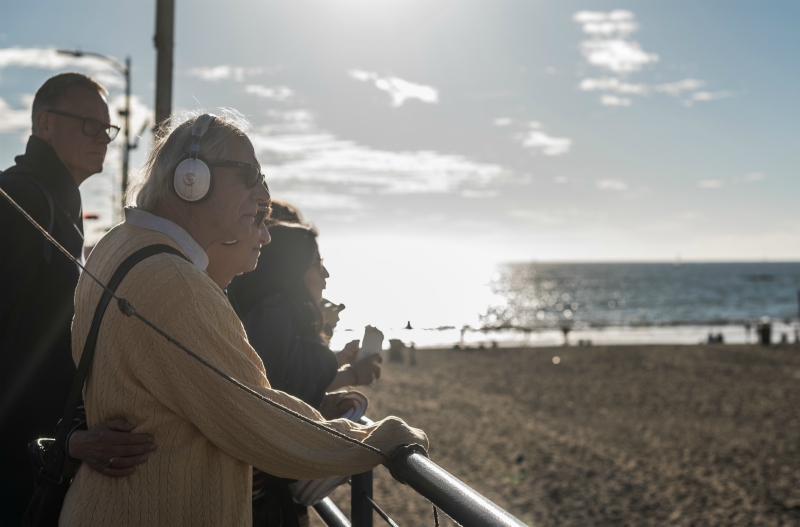 Participants are provided with a cell phone and pair of headphones through which the audio guide is transmitted simultaneously to everyone in the group. An actor’s voice guides their steps and their gaze, prompting them to intently observe places, colors, street performers, and strangers’ faces. They’re asked to imagine details of the lives of the people in the crowd, to picture their homes, families, dreams, and ambitions. They’re asked to follow a stranger and imagine what they might have in common. The second half of Among Us takes place across the street from the pier on a big, empty grassy knoll in Tongva park. Here, instead of blending into a crowd and observing others, the participants are the ones on display. They are asked to actively respond to a series of rapid-fire questions with a physical gesture, like raising a hand, forming a circle with others who answer similarly or taking a step forward or backward. The process is revealing, and it forces participants to publicly examine intimate truths about themselves and each other (or to specifically resist doing so). She has noticed that the size and dynamic of the each group changes the experience from performance to performance, too. The question, “Do you think life will be better for the next generation?” takes on heightened meaning when a member of the group has their baby in tow. At the end of Among Us, I realized I had not looked at my phone once during the entire experience. I had not taken a single photo. I was too busy experiencing art, observing the world around me, and interacting with my community to check social media. I was too immersed in reality to post about it on Instagram.